Sap. Sapped. I’ve had my fair share of both lately. What do I mean? Let me explain. First I will explain being sapped or devoid of energy or motivation. This week I am struggling to push myself in a forward direction. I would like nothing more than to sit with my feet up, reading a great novel. Or perhaps flip through my library of gardening books. I’d gladly succumb to either. It sounds like heaven right now. I knew this week was going to be draining. I’ve been gearing up for it since last week. Even though I’m an “enjoy the moment” kind of person, I’ve been looking ahead to what is on my goal and “to do” list this week. This week started off with a bang. I kicked off with a health trade show for seniors promoting my business Live Love Be Green. Health is of the utmost importance at all ages. I strongly believe that through proper nutrition, superior quality supplementation, physical activity, spiritual wellness/inner peace, and a toxin-free home we have a winning combination to great health. The event wasn’t a long one (5 hours), but gearing up and getting into the right head space was eluding me for some reason. I had a great day talking with folks I otherwise would not have had any contact with. It was quite enlightening and occasionally somewhat frightening to hear the medical horror stories and trials so many seniors face each and every day. This encourages me to take good care of myself now to hopefully avoid years of drug-induced issues. Eye-opening, really. Two days of this week I will be working with the goddesses of gardening which is physically challenging most days. Sure gardening is a great past time and is enjoyable, but when this is your profession rain or shine or extreme heat and humidity like this week brought us, it can be utterly exhausting. This aside, I love what I do and the wonderful group of women I work with. They are always professional and passionate about what we do and bring a sense of enjoyment to each and every day. Even if everyone is exhausted. To wrap up this week I will be working another trade show for three days out-of-town. This promises to be a weekend of fun and personal growth. I’m truly looking forward to this but I’m not thrilled with being away from home and my family. I always miss them. I am motivated by my purpose of promoting a healthy environment through toxin-free cleaning products. I will delve into this subject soon. I will be working with another passionate individual that shares in my quest for positive change. This individual somehow always gets me to go outside my comfort zone to expand myself to new heights. For this I am thankful. So, needless to say, the high amount of energy needed to fuel me this week is colossal. I will treat myself kindly and not stress out. I will stay focused so as to not feel totally sapped. I’m feeling long-winded today for some reason. Hope you are enjoying a cup of coffee (or whatever your preference) while reading my blog today. OK, sap. You know, the sticky stuff that oozes slowly out of evergreens and gets all over everything. Well, last week I had a run in with a pine tree. Don’t get me wrong I love evergreens and the amazing fragrance they have. I find sap fascinating, really. Just not in my hair! After a hot and sticky day on the job from the grueling heat and magnitude of mulch we handled in one day I was thankful for a cool shower. I was not thrilled when I encountered clumps of sticky sap in my hair though. And on my arms. And legs. And clothes. I tried everything I could think of. Extra shampoo, soap, nail polish remover (stinky and nasty), conditioner. I even cut out a clump of hair from the nape of my neck that was a big, sticky lump of sap. Thinking it was all out I started brushing my hair. SNAG! Argh. All through the back of my hair I had huge gobs of sap! Cutting that section of my hair was not an option so I decided to try something I hadn’t tried yet. Don’t know why I hadn’t thought of this in the first place. Sometimes I wonder where my brain is. I got out my bottle of Basic H and poured a bit onto my palm then proceeded to rub it into my still damp hair where the sap was. I kid you not, the sap just let go of the hair the second the Basic H came into contact with it! Not only did the sap come out quickly with no mess, Basic H is non-toxic and fully biodegradable once it’s washed down the drain. It’s also non-drying to my hair. I can’t say the same for most shampoos on the market. Needless to say, I instantly reach for my bottle of Basic H when I get sap on me now. I even wash my hair with it instead of shampoo occasionally just for the fun of it! I highly recommend it. Trying not to feel sapped. Interesting week I’m having…to say the least. There has been something niggling at me for a while now. Not a bad niggle, just something that needs my attention. I’m not sure if you have taken note of this but it drives me to distraction some days. Why does everything come with so much packaging? Even with minimal packaging there is still so much recycling and garbage that piles up. Almost everything comes with some sort of excessive packaging, short of fruits and veggies that Mother Nature has nicely packaged herself without extra waste. At least this packaging, if not consumed, can go into the making of beautiful, rich compost and go back into the earth in a productive manner. Mind you, some fruit growers and/or their wholesalers feel the need to encase produce in evil plastic packages and shrink-wrap. I try to shop to avoid excessive packaging but my recycle bins seem to overflow each week. I recycle absolutely everything I can and have set up a recycling station in my kitchen. Two large bins to collect paper and plastics/cans/bottles. I always have a separate heap of plastic bags to recycle too even though I only use reusable shopping bags. A couple of weeks ago I forgot my reusable bags so I purchased a few plastic bags (feeling guilty the entire time I was bagging and carrying my groceries, hoping no one saw me carrying plastic bags) thinking I could use them at some point as garbage bags. Ack! My Guilt-O-Meter instantly blew up! Every time I open my pantry and see the measly couple of reserve bags in my bag dispenser I have to look away quickly and distract myself to avoid the trip down Anguish Avenue. Change of subject for my sanity. I have been working diligently on reducing the amount of garbage each week. For the last couple of years, I have been able to put out the garbage pail for collection with two small grocery bags, on average. Some weeks I have no garbage at all to put out at the curb. When I see other people’s garbage piles I wonder what the heck they are throwing out to have such a mass amount of garbage each week. Not that I really want to know. It would probably irritate me to no end. I think that my two small grocery bags is excessive for my family as it is. So, I’m plugging away at reducing garbage and packaging and sorting my recycling responsibly. Once there is a system in place it is simple to allocate everything to its proper place. It actually makes things easier to sort as I go along. This way on recycling/garbage day it is mere minutes collecting the bins and dragging them to the curb. Much better than having to sort everything while collecting. Do you have a tip for reducing garbage and recycling? I’d love to hear your ideas. When it comes to garbage, there is no such thing as throwing it away. Fellow Canadians and I have been celebrating this Victoria Day long weekend, or more affectionately called “May 2-4”, by gearing up for the summer season ahead. I have been excitedly awaiting the coming of May 2-4 weekend to plant my new garden. I prepped by scouting out the best heirloom vegetable grower in my area and scheduled a short(ish) roadtrip with my daughter as my sidekick. What a blast! I could not have taken a more helpful and inquistitive companion. We were elated to find almost everything we had envisioned growing in our garden. On the ride home we talked about every plant and seed packet we purchased with escalating excitement. My sidekick has, by her own suggestion, taken on the herb portion of the garden as well as the position of co-harvester. Of course I didn’t hear an answer when I asked for help with future weeding. Am I surprised? Not at all. These are the beautiful heirloom vegetable plants awaiting their new home (a.k.a. our garden). There is absolutely nothing “normal” in this tray of veggie plants. By normal, I mean a variety that we could purchase at the average grocery store. Come to think of it, we were so fascinated by all the wonderful varieties that I don’t think we purchased any red tomatoes! Oh well. The garden received one final rototilling before planting. After the tilling, I cultivated the soil slightly to make it more even. I then took a much needed rest to rehydrate and cool off. I would highly recommend this refreshing beverage of pineapple soda and Malibu coconut rum over ice…yummmm. After cooling off, it was time to get back to work and stop wasting time. I laid out all the plants where I thought they should reside to ensure I spaced them well for future growth. Nothing bugs me more than seeing gardens all crammed together so the plants don’t receive adequate sunlight. OK, maybe that’s not totally true…I can think of a few other things that bug me more, such as rudeness, greed, lying, socks with sandals, and the revival of banana clips to name a few. Now where was I? Oh yes, after alotting for proper spacing of the plants and leaving room for the seeds I still had to sow, I tackled the task of placing each plant lovingly in its new home with its tag so I could remember what I had planted where. The seeds were attended to immediately afterwards. This is my first attempt at direct sowing into the garden so keep your fingers crossed for me that they will do well. Next task was to hunt down pieces of wood to write the variety of each row of seeds. I just used some old wood trim that I had around and wrote the vegetable type and variety in Sharpie, then stuck them in the soil next to the row of seeds. Reusing some interlocking brick from a neighbour, I laid a small walkway through the garden near the deck to deter people from walking through the garden and crushing plant life or having to trek all the way around the outside edge of the garden. The walkway isn’t quite what I envisioned so I think I will be revisiting this project at a later date. Evening intermission: enjoying the company of great friends and dining al fresco under the recently constructed outdoor light fixture. See earlier post. This morning saw me back in action in the garden. After lingering over my cup of fair trade organic coffee (yum) on the deck, I puttered around in the garden for a few hours. During this time period I transplanted unwanted plants from a neighbour’s garden and found new homes in another part of my back yard. I was then gifted with some much needed tomato cages! Bending them back into shape, they were installed in the garden with the tomatoes, peppers, and eggplant. Once the shade started to come over the garden in the late afternoon I watered it well since it was looking dry in spots and the seeds had yet to be given a thorough watering. The veggie garden is pretty much planted now. I think I will still add a few more herbs by the walkway since we go through mass amounts of herbs. The wooden posts in the foreground were installed so I could string jute horizontally so the beans can climb up, saving space. The posts on an angle on the left are for the cucumbers to be wrapped around, but I’m still mulling this over. I may remove them and just attach jute from a peg in the garden to the top of the pergola. I know from experience that cukes do well twisted around jute. A garden is never truly “completed”. Marigolds were planted among the tomatoes to assist with pest control. I can’t wait to see all the unique tomatoes! Tomatoes are, to me, the true taste of summer. I can eat tomatoes every single day and never tire of them. Just the thought of a fresh tomato straight from the garden makes my mouth water. There are a few things left to do in the garden as far as planting and prepping goes, but for now I’m content to take a breather. 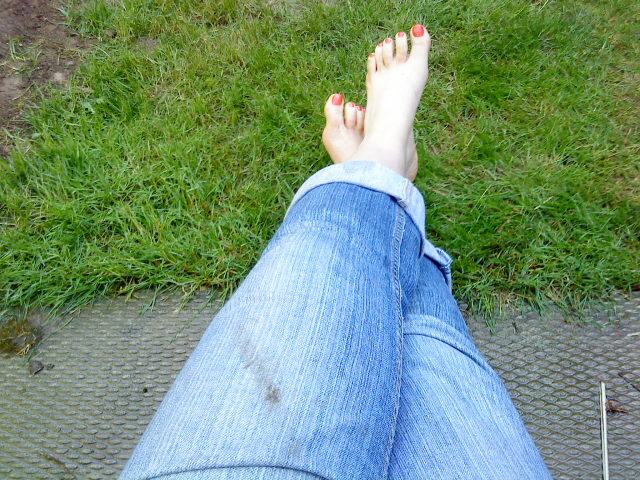 My jeans need to visit the washing machine and my feet are filthy… I am a happy woman. My work for this long weekend is done and I shall sit on the edge of the deck with my bare feet in the grass while I envision my garden growing. I would like to introduce you to one of my favorite places on Earth…especially at this time of year. This is the specimen I lovingly call the Bee Tree. The Bee Tree is breath-taking this time of year. For a brief period of about one week it is humming. Yes, it really does hum, or buzz if you prefer, with beautiful bees. Each Spring I await the coming of the drone of the bees. When the weather cooperates I sit on the deck or even under the tree and close my eyes to enjoy the sound of activity. I’m thankful I’m not fearful of bees and have the time to pause and take it all in. If you look up to the top of the tree it almost looks like the tree is moving there are so many bees flying from flower to flower. Truly astounding to watch. 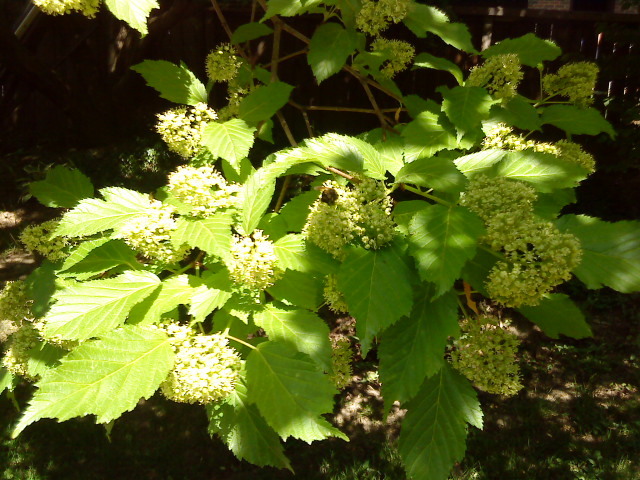 In the centre of the photo above there is one of the multitude of bees that visit the tree. The blossoms are not showy or obvious to look at but the fragrance is out-of-this-world. The scent is almost like a magnet drawing me in to sit near by to enjoy for a fleeting few days. I wish I could add a scratch-and-sniff photo since it is impossible to describe how glorious the scent is. Tomorrow I plan on spending as much of my day as possible enjoying the gifts the Bee Tree has to offer! I have been on yet another Top Secret Mission. OK not really, but calling it top-secret makes it seem so much more fun. I decided a couple of weeks ago that I would like a light fixture over our outdoor dining table. After looking around at a few stores and seeing what’s available, I decided to tackle making one myself. Besides the fact that the cost is prohibitive on many outdoor fixtures and most are not to my liking, I wondered if I had the materials to make my own unique DIY version. In the spirit of reusing and recycling, I pondered over different materials already around the house then gathered together my chosen objects. Here are the materials pictured below. One string of LED outdoor Holiday lights, wicker/rattan balls, hanging basket chain with three chains connected to top hook, paperclips, and a stainless steel ring from an old kitchen light fixture. I connected the three hooks at the end of the chains to the metal ring and pinched the hooks together against the ring to avoid the chains sliding around. I hung the fixture low so I could work on it while it was hanging. This gave me better access than laying it on a surface. I started by pushing the end light bulb on the light strand into a wicker ball then draped the light strand over the ring so the ball hung from the ring at the desired level. I wrapped the light strand around the ring, occasionally adding another wicker ball at varying heights. In total I used seven wicker balls. I ended the strand of lights by trying to conceal the plug end on the inside of the ring. To hold the light strand together where it hangs down then back up to the ring I hooked metal paperclips around both strands to hold them together. This made it look nicer than when the strands separated from each other. After it felt complete, I hung the fixture from the centre of the pergola over the table. It took some adjusting to get the correct height from the table. I wanted it to be long enough without banging my head on it every time I stood up. I used another piece of chain that I already had to wrap around the pergola and hang the fixture from. Using an outdoor extension cord, I connected it to the plug on the fixture then wound it up one of the chains tightly up to the pergola. I thread the cord along the pergola over to the wall where it hangs down the wall to the outlet. Different angle looking out into the garden. Once darkness falls it is as simple as plugging in the extension cord and voila…instant ambiance! Inside each wicker ball there is a light bulb. Outdoor dining and party season is quickly approaching. Bring it on! I’m accomplishing things on my “to do” list as well as making the time for small indulgences. For instance, as my reward for mowing the grass this morning I gave myself a pedicure. Yay me! Today is about loving Life while being (somewhat) productive. I do not own a “World’s Greatest Mom” t-shirt. Nor do I ever want to. I strive to be inspirational and a guide along the path of life to my children, not to blow my own horn as World’s Greatest anything. Isn’t life about learning along the way? Making mistakes so we can improve? Laughing at ourselves and the little things that tickle our funny-bone? That would be near impossible if we put ourselves on the “World’s Greatest” pedestal. I don’t always want to be serious and disciplinarian or on the flip-side a jellyfish with no backbone. I strive to be somewhere in between. To laugh each day with my kids but still be able to pull out “the tone” when needed. You know the tone…the one that makes everyone stop what they are doing and listen up. Or maybe you have “the eye” down to a science. Both come in handy periodically. My main objective as a parent is to assist my children to become productive and confident adults that love who they are while always being open to learn new things. Closed minds will not grow, but stagnate at a certain point. To be accepting of themselves and others for who they are in the moment. To take ownership of their health and be armed with the tools to do so; and not blinded by the ideology of marketers and big business. To always have a dream that propels them forward. These are the basic principles that I hope to be instilling in my children’s thoughts and hearts. A couple of weeks ago I was out with my daughter at a grocery store and we noticed a family of three – a mom, dad, and a young child perhaps about 3 years old. We noticed them because of how both parents were responding to the little boy. He was innocently dancing and singing and just being generally happy. The mom was totally oblivious while the dad kept yelling at the little boy. My daughter pointed out how she thought that the dad yelling at the boy was unnecessary and that she felt sad for the boy who was so cute and just wanted to have fun in a place that was probably extremely boring to him. He wasn’t bothering anyone by being in the way or being loud. But here’s the kicker: the dad was wearing a “World’s Greatest Dad” t-shirt. This is the situation that really got me pondering the t-shirt pomp. What do we consider great parenting? To me parenting is not just about housing children to adulthood in our home but about caring for another person so much that we want them to succeed in the world after leaving our loving, nurturing nest. To love our children with not just our hearts but our heads as well. Guidance and problem solving, to me, is a huge part of parenting rather than trying to replicate yourself. Having a parent that loves unconditionally with no-strings-attached becomes a safe zone for children. We all need a safe zone. Somewhere we can be free to say or think what we need to, just because. I’m hoping this Mother’s Day I don’t receive a “World’s Greatest Mom” t-shirt. I don’t need another dust cloth. Life swirls around us so quickly most of the time that it becomes easy not to notice how glorious Life truly is. A beautiful blossoming tree, a smile that lights up an entire face, a kind word or hug from a friend, or a child’s laughter. Enjoy the little things and the big things won’t seem so daunting. This realization seems to come easily for some, for others it never arrives. I am thankful that this wisdom,if you will, has come to me while I’m in my 30’s. I shudder at the thought of never finding this form of inner sanctuary. In my personal search for ways to “green” my life, I seemed to stumble upon this realization. When we think of ourselves as part of a “whole” in terms of co-existing with the Earth the puzzle pieces of Life just seem to click together. I really started to think seriously about how my actions affect not just myself but the world while I was in my 20’s. Being around people with an appreciation for nature really slapped me in the face that although I thought I was environmentally friendly, carrying a reusable travel mug while peeling around in my gas-guzzling Mustang just didn’t cut the mustard. I have been vegetarian off and on throughout my life for different reasons but mostly because, as a child, I was incredibly freaked out about eating something that was able to think and feel. I also had an aversion to worbly bits of fat in my mouth. While no one else in my family was vegetarian or ate like I chose to, I feel that my parents and siblings have always supported me and my decisions. I have altered my eating choices over the years but I have remained mainly a vegetarian. I had a few brief forays into meat-eating and found I felt worse, not better as many suggested I would, and always came back to where my body and heart led me. I enjoyed strict veganism for a few years but love (and I do mean love) butter so much I added it back into my world. Everything really does taste better with butter when baking. And I love to bake! I even chose raw food veganism for a while after my youngest child was born. I lost all the weight I had gained from the pregnancy plus more and felt fabulous. One day I just needed some bread. Lettuce leaves instead of a tortilla was only satisfying for so long for me. I needed something to sink my teeth into! A beautiful whole grain organic bread hit the spot and so my 85-90% raw food lifestyle was put on the back burner. I’m still vegetarian and can’t envision being any other way. It is the most earth-friendly way of eating which means a great deal to me. Feeling great and powerful from ingesting good food is an incredible added bonus. Striving for a cleaner, greener lifestyle not only led me to being conscious of what I eat but where it comes from. Finding organic, unprocessed foods can be a challenge but pays for itself in the long run. Your body will thank you. Another reason to grow your own veggies (as if we needed a reason)! I know it isn’t always possible for everyone to eat 100% unprocessed organic and home-cooked. Wouldn’t it be nice though? Every little bit towards eating a cleaner, greener way will not only benefit you and your family but the Earth will thank you too. I knew this morning upon waking that it was going to be a long day. That it has been. I try to stay positive and find the wonderful qualities to things but sometimes I just have to call ’em like I see ’em – today has not been so hot. OK, the temperature was warm and my blood was boiling on occasion but today will not go down as one to remember. I don’t want to turn this into a gripe-fest, I just need to air my thoughts a bit to bring back my positivity. Hope you don’t mind. I will share a bit of insight into who I am and what I do to get the ball rolling. I am a mom of two children and I am an independent representative for Shaklee and operate my home-based business by the name of Live Love Be Green. I am also a Horticulture technician and am employed as a gardener. That about sums up the core of where I’m at in life at present. Now the stage is set. I am generally an early riser (the early bird catches the worm!) and just had this foreboding feeling this morning that today may be a bit rocky. I tried, really I did, to put on a smile and send positive vibes outwards to get my day started properly. I was working at my gardening position when all that positive flow came to a screeching halt around 10 am when a pounding headache emerged. As the minutes crept by the pain intensified until I was at the point of feeling light-headed and nauseous. Leaning forward pulling weeds and debris does not aid in head pain, let me tell you. Neither does pesticide stank or steaming mulch. Finally making my way home this afternoon I was slammed by the reality that my dishwasher is on the fritz (again) and there was washing up to be done. I decided to do about half of the dishes then reward myself with my first cup of coffee of the day at 5pm. Thank you caffeine! My headache finally vamoosed! My front door then seemed to become a revolving door as visitors seemed to show up in droves. I have had enough of today…bring on tomorrow! I have decided that it is a great evening to have a glass of sumptuous red wine and focus on the good things today brought. These are the things I have come up with thus far. I have already decided that tomorrow is going to be fabulous!